Here are some of the question students typically ask AIA staff. If you don’t find an answer to your questions write us. If you have questions about specific courses, credits, tuition and financial aid contact your university directly. What will we do in this program? This is a VERY ACTIVE program. Classes are based on classroom prep followed by on-site learning. So you will spend as much time in the field as in the classroom. There are four principle activities. 1) Study Sustainable Architecture and Urbanism; History, Theory and Analysis; Professional-level Design Studio; Italian Cities and Landscapes and Italian Language. 3) Meet local designers and other professionals. 4) Visit many contemporary and historical sites across Italy. See your program’s page for specifics about courses and curriculum. Rome is a cultural metropolis where cutting-edge contemporary architecture shares the streets with some of the world’s greatest historical monuments, and where the principles of sustainability have proven themselves over thousands of years. 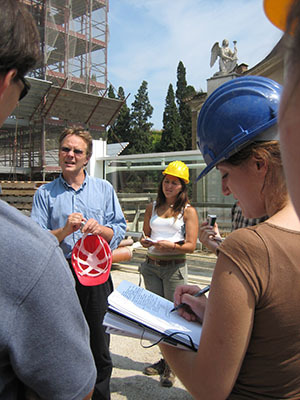 Study in Rome, and discover how Italy has forever transformed timeless ideas into contemporary culture. Rome is also a safe and pedestrian city of vibrant small neighborhoods and local markets. It is a major transportation hub connected by train and air to big cities and small towns across Europe, and to both the sea and mountains. AIA’s modern and well-equipped facilities are located in an historic palace in the heart of Rome, just a few blocks from major monuments like the Roman Forum, the Pantheon and the Piazza Navona. We offer design studios, classrooms, IT/printing resources, a library, lounge spaces and terrace. Wi-Fi is is provided throughout the facilities. You can meet students from other programs there too. Is it all about history? No, actually the program is mostly about current design issues, culture and sustainability. But, Rome truly is the Eternal City, and you will learn about its present state in the context of the past, so you will get to see remarkable historical monuments and museums up-close with special access and expert instructors. You will visit Rome and Italy’s important new architecture by architects like Zaha Hadid, Renzo Piano, Richard Meier, Massimiliano Fuksas, Tadao Andō, Santiago Calatrava and many young Italian designers, in Rome and other places you will visit in Italy. Travel is part of regular courses, so it is academic in nature. You will get expert tours and special access to cultural sites. You will also have independent time to explore on your own. We want you to be able to concentrate on learning, so field trip travel is both reliable and comfortable. We travel on high-speed trains and chartered coaches, we stay in modern hotels, and special group dinners feature regional foods. See your program’s page for specific itineraries. What are the Studios like? Studios are active and serious, and meet three times a week. You will design a large and complete project. The schedule is divided into design phases to break the work up and move it forward. You will study the city and site, create an urban plan, and develop a detailed design of architecture, landscape and urban space. Some work is done in teams, but each student will develop his/her own project. Instructors encourage you to work in all manual and digital media including from hand drawing to 3D digital design and video. AIA’s language coordinator, Claudia Cremasco, has been turning Cal Poly students into Italian speakers since 2002. Her award-winning university-level Italian classes often include film screenings and Italian cooking lessons. Check your program’s page to see if you university offers credit for language instruction. 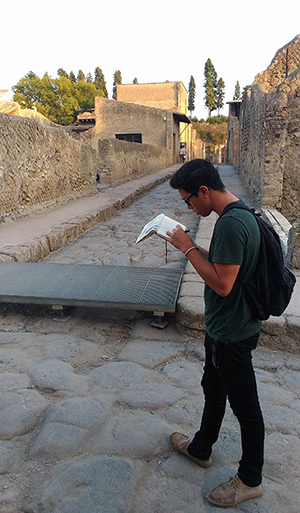 You will have free time each week to explore Rome, there are a few long weekends and the program calendar includes a 9-day mid-term break, which many students use to travel to other places in and outside of Italy. Yes. Unless you have a passport from a Schengen Area country (in the EU) you will need to obtain a study visa 90 days before you begin your semester in Rome. AIA provides enrolled students with advice and a some documentation to help with this process. Student safety and security are AIA’s first concerns. We offer secure facilities and housing, well planned field trips and student support services. We also help students take responsibility for their own well-being. AIA treats student like the adults they are, by both respecting their independence, and expecting them them to act responsibly. Instructors and staff get to know each student. The AIA Student Handbook offers advice about living in Italy and avoiding problems – or dealing with them. AIA’s Code of Conduct also helps students make mature choices and respect one another. Note: The risks of poor judgement are much more serious in a foreign country, especially with regard to alcohol and substance abuse. Most student safety problems result from abuse of alcohol – and so, can be avoided. Copyright 2017 Academic Initiatives Abroad Inc. All rights reserved. Academic Initiatives Abroad Inc. is a Massachusetts registered corporation, identification number 001011888.